Hard Stop by Chris Knopf, a Mysterious Review. Review: Master craftsman and ex-corporate executive Sam Acquillo is "asked" by the CEO of his old company to look into the disappearance of a former colleague in Hard Stop, the fourth mystery in this series by Chris Knopf. When Sam finds someone snooping around his house, he takes it personally, taking the guy down and finding out who hired him. It turns out that the head of Con Globe, a massive energy company and, not coincidentally, Sam's former employer, is behind it. When Sam confronts him, it's all about getting leverage on Sam to do a job for him, namely, find Iku Kinjo, a hot shot analyst and his secret lady friend, who has gone missing. Sam agrees to find her, and does, but she's dead in an apparent suicide that clearly wasn't. Though Sam's responsibility ends here, he's troubled by her death and continues to dig. And his digging stirs up all sorts of attention, mostly of the unwanted kind. The best mysteries are all about character, plot, and setting, and Chris Knopf excels at all three. Hard Stop sets a breathtaking pace right from the start and doesn't let up. In fact, it may be a little too brisk as the intricate plot involving corporate mischief doesn't really start to come together until the final few chapters. In a way, though, that's part of the appeal, disparate pieces of a puzzle that have no apparent connection, suddenly coming together to form a picture of what really happened … and why. The characters are all fully realized, even the minor ones, but none more so than Sam and his dog Eddie, giving the story a depth and richness that fans of the genre will relish. The setting is not the Hamptons of the ultra-wealthy, though they are present and accounted for here, but of everyday people who live and work on the island. Knopf has a marvelous way with words, making Hard Stop a real pleasure to read. Here's a passage that gives the book its title: "I'm always offended by the arrogance of people who think killing other people is a legitimate undertaking. I wonder, how do you get up in the morning and think to yourself, gotta do some errands, wash the car, and if I can fit it in, permanently snuff the lights out of someone's beloved husband, brother, mother, sister, son? I've never considered myself more deserving of life than the next guy, probably less, but at least take a second to think about it. Altruism doesn't come naturally to me, but it was easier to apply this line of reasoning to Iku Kinjo than to myself. No willful murder is justified, but hers felt less like an act of butchery than a surgical elimination. A tactical execution. Maybe that's all it was, a simple transaction. A line item on a profit and loss statement. Case closed. Meeting over. The ultimate hard stop." 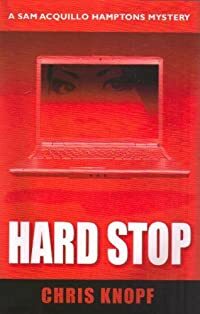 Chris Knopf is among the most literate mystery authors writing today, and Hard Stop is a terrific example of his work. It is not to be missed. Acknowledgment: Chris Knopf provided a copy of Hard Stop for this review.